exceeded his grasp -- that bungled Big Brother subplot, f'r instance -- Iron Man felt like it was exactly the movie Jon Favreau and company set out to make. That smirking charm, a cacklingly witty sense of humor, just enough of a dramatic wallop, and a heckuva lot of balls-out superhero action...? It's the best time I've had at the theater in a couple of years. Okay, and you're probably wondering why I'm rambling on about this summer's live-action flick when the big, bold letters at the top of the screen say that this is supposed to be a review of The Invincible Iron Man. Here's the thing: I don't think I would've thought much of this animated spin on ol' Tin Head if I'd trudged through it last year, but hitting Blu-ray so soon after the pitch-perfect live-action version...? It makes a mediocre movie just seem that much worse. 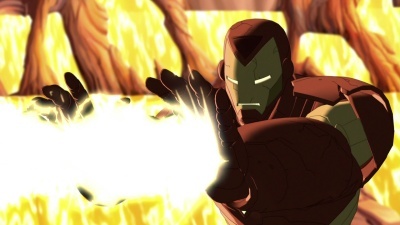 The Invincible Iron Man opens in a remote stretch of China...the ancient home of the Mandarin empire that ravaged the country and exterminated hundreds of thousands of people before being entombed deep beneath the earth. The center of the empire has remained buried for three thousand years, and the prophecies claim that if the city were ever to rise again, the Mandarin will return to wreak unparalleled havoc upon the world. So, umm...guess what happens? blunt instrument of a suit he assembles as a captive is just the latest in a long, long line he'd secretly been building over the years. As he invents the armor in the comics, he's reinventing himself, and the movie loses sight of that. Even worse, Tony only dons any sort of armor a few times in the film, and the iconic red-and-gold suit plastered all over this Blu-ray disc's cover art is barely in it. I'm not sure The Invincible Iron Man even knows what it wants to say with the character. I mean, this Tony Stark grandstands against his father for shilling weapons, and then it turns out he has a 5,000 sq. ft. chamber that's packed wall-to-wall with hundreds of millions of dollars worth of suits of armor packing missiles and repulsor rays... I mean, that doesn't qualify as weaponeering? Tony insists that his secret project holds the future for Stark Enterprises, so clearly he couldn't have been holding onto them just for himself. 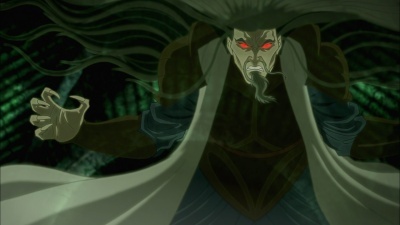 Screenwriter Greg Johnson boasts about how clever the movie's mix of mysticism and futuristic technology is, but the story slowly plods along, the elementals are bland and uninteresting adversaries, and the Mandarin's hardly in it at all. This is a very different take on the Mandarin, and for whatever reason, Iron Man has essentially nothing to do with what happens to the revived madman in the final moments of the movie. Oh, but there is a scene with Iron Man grabbing a sword and fighting a dragon, he types with a half-confused yawn. There's a strange, clunky sexuality to the movie as well, feeling on one hand as if it really wants to push the envelope but is too timid to actually go through with it. The Invincible Iron Man handles its brutal violence much more deftly. The maiming and murders all take place off-screen, but the pervasive sense that these characters can die ratchets up the intensity; the Jade Dragons aren't COBRA soldiers who can fire off a few billion rounds without ever making a direct hit. 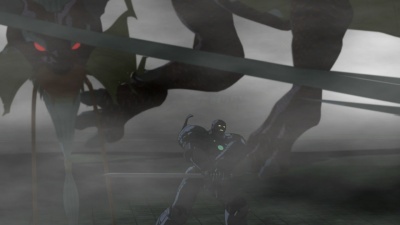 Tony's suits of armor take a heckuva lot of abuse, and the animation continually reminds viewers that these suits aren't indestructible and that there is a man inside. The design of the armor -- especially the crude suit secretly assembled in captivity -- is impressively daunting, and the look of the movie as a whole has clearly been crafted by an especially keen eye. It's just too bad they're not part of a bettter flick. With Jon Favreau's take on Tin Head still fresh in my mind, it's hard for me to make that transition from a flick overflowing with personality to an animated version almost entirely devoid of any. Rent It. didn't spot any artifacting, heavy banding, or any technical misstep in this Blu-ray disc at all, although the animation itself is a bit of a mixed bag. It can be really choppy, and the elementals in flight look like Colorforms being dragged across the screen half the time. Some pretty nasty aliasing rears its head near the climax, although I'm guessing this is an issue with the CG rendering rather than a hiccup in the AVC encoding. On the other hand, there's some really nice attention to detail in the animation, particularly the cumulative damage the Iron Man armor suffers throughout each brawl. Although the uneven animation does drag down my overall rating a bit, I'd bet this Blu-ray disc is indistinguishable from The Invincible Iron Man's original master, and for an animated movie produced in the digital domain, that's the best we can ever hope to see. Audio: Sprawling across eight channels, The Invincible Iron Man's DTS-HD Master Audio soundtrack is so clean and aggressive that it outclasses a lot of live-action movies. The track is bolstered by a colossal low-frequency kick: a temple is nearly toppled by an oversized hammer, the pounding thuds of the earth elemental as he stomps towards Iron Man rattle everything in the room, and the track is teeming with devastating explosions. The sound design was clearly assembled with a multichannel mix in mind, not just shrugging it off as an afterthought the way so many direct-to-video flicks do, and it's remarkably enveloping. 'Course, it doesn't hurt that this is a movie that has hundreds of thousands of rounds of gunfire peppering the mix from every direction and continually sends rockets, primal, ancient elementals, and a billion-dollar suit of armor screaming across the soundscape. Even more subdued sequences are fleshed out by a strong sense of ambiance. The voice acting is a little too Saturday morning for my tastes, but the recording is consistently clean and clear, rendered without any sign of strain or clipping. The dialogue also isn't overwhelmed even in the movie's most violently chaotic stretches. This is a first rate effort from Lionsgate. A Spanish Dolby Digital 5.1 soundtrack has also been included alongside subtitle streams in English (both traditional and SDH) and Spanish. the disc's extras is a fairly rough animatic of The Invincible Iron Man's original opening. This alternate intro is really just meandering, clunky exposition spelling out the backstory of the Mandarin and his prophecized return, and the movie's better off without it. "The Origin of Iron Man" (12 min.) piles together interviews with the filmmakers -- screenwriter Greg Johnson and producers Craig Kyle, Eric S. Rollman, and Frank Paur -- along with Joe Quesada, seminal Iron Man writer Bob Layton, and artist Sean Chen from the Marvel bullpen. This featurette is really more about contrasting the movie from the comics than anything else, pointing out the revised origin since 'Nam's not exactly timely these days, redesigning the first version of the armor Jack Kirby created all those decades ago, and noting other changes made to pack more of a dramatic wallop in an eighty minute animated movie. 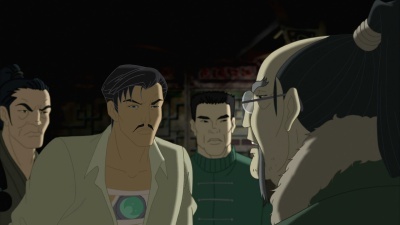 It's kind of odd to hear the filmmakers take so much glee in their re-envisioned Mandarin and the contrast between technology and mysticism since I found those to be some of The Invincible Iron Man's biggest pitfalls. "The Hall of Iron Man Armor" cycles through a long list of Tony's suits from the comics, serving up a fairly detailed description of each and pointing out which issue it was first introduced. It's pretty extensive but cuts off with a nearly ten year old suit, making no mention of the current Extremis tech, for instance. A three minute reel of conceptual art shows off storyboards, character designs, wireframe models, test renders, and painted backdrops. Rounding out the extras are plugs for other animated Marvel titles, including Hulk vs. Thor, Next Avengers, Ultimate Avengers 2, and Dr. Strange. There are also "first look" previews -- revolving around interviews with the filmmakers and quick clips from the movies -- for Hulk vs. Thor and Hulk vs. Wolverine. The plugs and teasers are in high-def, and the disc's other extras are all presented in standard definition. Conclusion: Jon Favreau's take on Iron Man gets the nod as my favorite superhero flick, but this animated version isn't even close to being in that same league. The Invincible Iron Man is anchored around a bland, two-dimensional Tony Stark, barely bothers with the Iron Man armor, crams in a bunch of uninteresting badniks, struggles with a stale, muddled modern-versus-magic theme, and limps to a lifeless conclusion that at the end of the day has nothing to do with Tony or his bleeding-edge tech anyway. This Blu-ray disc looks and sounds great, but the movie's too disappointing to recommend buying sight-unseen. Rent It.